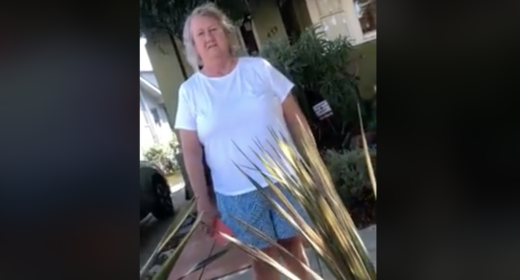 A new viral video shows a Bay Area psychologist threatening to call the police on a Spanish-speaking family for parking in front of her home in Oakland. In a Facebook post, Jordan Cordova writes a white woman confronted him last Saturday. He was with his family and they were attending a party on the same block. The San Francisco Chronicle identified the woman as Lesleigh Franklin. The news outlet also reported that Franklin is "the head and founder of the East Bay Family Institute, an Oakland center that provides mental health services and works with the immigrant community." "She wanted us to leave," Cordova writes in the post. "As we refused, she approached our car and tried to open the door." Cordova writes he video recorded the incident with his phone because he felt attacked. "We know these situations have happened already to black and brown people because of how we look," Cordova writes. In the video, Cordova informs the woman that his car is parked on public property. "We're not invading your property, we're not doing anything wrong," Cordova says on the video. He then invites Franklin to call the police. That's when Franklin asks Cordova where he's from. Cordova asks her why that matters. "Because I'm an immigration attorney," Franklin falsely states. A voice can be heard responding, "I have papers, I'm a resident." "Resident isn't the same as citizen," Franklin says and adds that the police will take them. "It's sad to see people like you these days," Cordova says in the video. "I hope such things like [this video] go viral, ma'am, to expose people like you. Absolutely racist, we're simply parking here." Franklin responds that her partner is from Mexico, implying that she can't be racist. The video is one in a series that recently has shown bigotry and claims of racism in the Bay Area. According to the San Francisco Chronicle, Franklin's partner Marisol Reyna -- who hadn't viewed the video -- said it doesn't reflect her true nature, adding that Franklin issued an apology and felt terrible about it. "Unfortunately, Dr. Franklin was just diagnosed with an illness [that] impacted her mental state of mind on that particular day," said Reyna, "but that's not an excuse." Reyna said Franklin has worked with immigrants to conduct psychological evaluations in the past as part of their immigration cases.